Went though Newtown tonight, and noticed that Daniel Mostyn hair has been replaced. 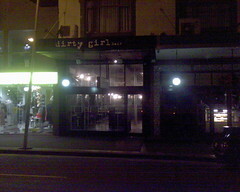 The shop is now labeled Dirty Girl hair. The font of the new title is the same as used for the previous name. I wonder if he has closed or moved elsewhere? Maybe just a change of image? Though would you want to loose your name? There seemed to be some changes on the front of the shop. And maybe a notice. But as I speed past in the bus I didn’t have a change to read them. Anyone know what happened to the shop? This entry was posted in Photos and tagged hairdresser, Newtown, photo. Bookmark the permalink. both salons are pumping ! king street is known for the both now.